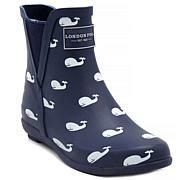 Brave the storms with style. London Fog is a premier lifestyle brand known for its updated classics. 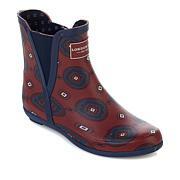 Striving to deliver wearable rain boots that balance classic and fashion is what the brand is known for. So sad, superute but poorly sized!!! 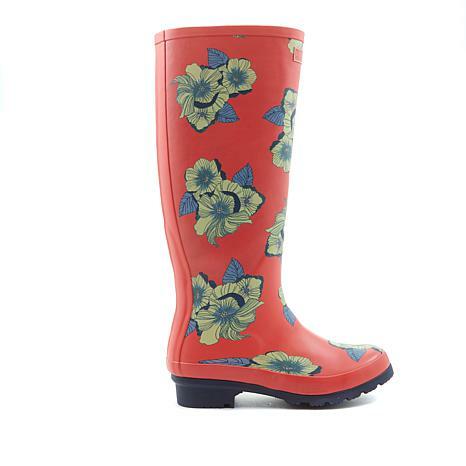 Ordered in Navy&Pink Floral in size 8, my true size is 7.5. Read reviews and went ahead and ordered as the reviews abt being tight on the calves would most likely not apply to me as I have skinny calves and ankles. 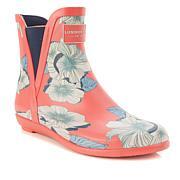 Chose these rainboots over several others on HSN and QVC. The perfect match to my pink columbia rain jacket (bubblegum/pepto pink). Boots are pretty. Sadly the calve opening is way too small (tried on with a mini skirt) shocked even my calves were wrong for these boots. Had to return. 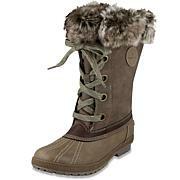 These boots are so cute and fit my foot however they are tight on my calves.